Above, two power cars being used for shunting 1996 stock. Rickmansworth 1999. After trials with the 1956 tube stock, 532 cars (forming 76 7-car trains) were ordered from Metro-Cammell for the Piccadilly Line. Of the same 3 and 4-car formation, the GEC traction motors and BTH (now GEC) control equipment were the same as supplied with the 1956 stock, but fully automatic couplers were fitted to all driving motor cars. Delivery commenced in 1959 but early in 1960 it was decided that the rolling stock on the Central Line was in need of replacement as a matter of urgency. 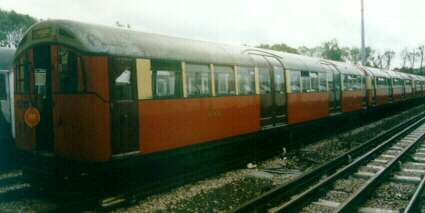 Originally it had been intended to replace the Central Line stock by trains of 1960 tube stock but there was insufficient time to test the prototypes thoroughly because of the need to provide increased accommodation in readiness for the Eastern Region suburban electrification at the end of 1960. As a result, after the delivery of the nineteenth train to the Piccadilly Line, the following 57 trains were diverted to the Central Line. The Central Line uses 8-car trains (two 4-car units) and in order to make up these 57 trains to eight cars a further 57 non-driving motor cars were ordered from Metro-Cammell. Above and Below one of the celebrity trains in 'heritage livery' at Morden Depot. October 1999. To re-equip the Central Line a further order of tube stock almost identical with the 1959 tube stock was placed. Metro-Cammell supplied 352 driving motor cars and 118 non-driving motor cars, and British Railways at Derby supplied 176 trailers. With the 57 non-driving motor cars previously delivered these cars formed 175 4-car units (871/2 trains) for the Central Line and one 3-car unit which was allocated to the Piccadilly Line. As trains of 1962 tube stock were delivered the 57 trains of 1959 stock were transferred to the Piccadilly Line but the 57 additional non-driving motor cars remained on the Central to make up all the Central Line trains to eight cars. 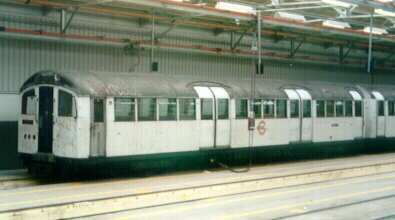 The cars of the 1959 and 1962 tube stocks were numbered in the same series, the Piccadilly cars in the earlier batch and the Central cars in the later. The 57 non-driving motor cars, although ordered earlier, always bore numbers in the Central Line series so that there was no need for renumbering when re-formed into 1962 stock trains. The odd 3-car unit was ordered for the Piccadilly Line to provide a unit for the Holborn-Aldwych shuttle, although it was not restricted to that working. Until recently the differences between the two stocks were not readily apparent, the principal feature being that the 1959 stock has a combined motor generator alternator unit whereas the 1962 stock has a motor alternator unit with rectifier. The first named produces both a dc (for control) and ac (for lighting) supply, the second an ac supply only part of which is later rectified to produce the control and battery charging supply. Both stocks can couple together for operating purposes. With the recent addition of an electric stabling light in the offside cab front the two stocks can be distinguished because the light is between the marker lights and the cab door on 1959 stock whereas it is between the marker lights and the offside on 1962 stock. This is due to differences in the internal layout of the cab. 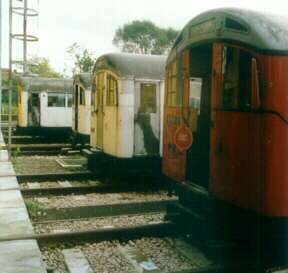 Above A line up of 1959/62 stock nearing the end of their days. October 1999. One 7-car train, comprising units 1020 and 1023, until recently was fitted with electric instead of air operation for the doors. The guard's panels were marked 'EDO' (electric door operators) for the information of the staff. As the Piccadilly Line was re-equipped with 1973 tube stock, the 1962 units temporarily on loan from the Central Line were returned there but two remained in 1978. In June 1973, 1071 and 2070 were damaged in a sidings accident and subsequently scrapped. 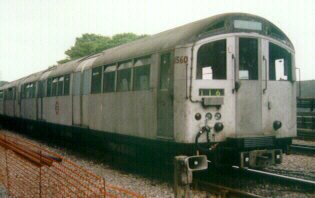 The remaining car of this unit, 1070, was retained as a spare and has been turned into a 'D' motor car to replace car 1309 which was badly damaged in the bomb incident at Wood Green in 1976, and it has been renumbered 1309R. 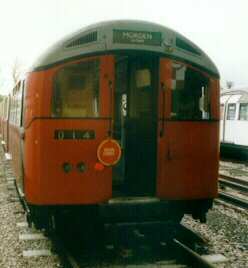 Above in Morden Depot October 1999. From 1969 onwards certain units of 1959/62 stocks have had the trailer car equipped with underfloor tanks and beam-mounted de-icing sprays in order to keep the conductor rails clear of ice without disruption to the passenger service. The units so equipped are designated with the letter 'D' under the trailer car number. On the Central Line the trailer cars concerned are those ending in '6' between 2406 and 2646. All the 30 4-car units of 1959 stock containing trailers 2100 to 2216 inclusive have been converted to de-icing.